Franklin, Pennsylvania, the county seat of Venango County, holds an important place in American history. An early frontier village of commerce and location of fortifications from the English, the French, and eventually Americans, the city itself had become established long before the oil boom of the second half of the 19th Century boosted its population. Although Franklin was located at the confluence of the Allegheny River and French Creek, a reliable fresh water source was needed for the citizens. Work on a reservoir for this purpose began in July of 1885, when a crew of around 100 men, mostly Hungarian and Polish immigrants, were transported to Franklin from Erie. Upon their arrival at the site to begin work, the men were told that they would be paid $1 a day for their labor. Claiming that they were offered at least $1.50 per day, the men walked off. Within several days, replacements were found, and the project began. The entire breastwork of the dam is lined with brick, as is evidenced by the abundance of loose brick still to be found on the site. Local residents say that the clay for the bricks was acquired from a lot along Congress Hill Road, at the top of Bully Hill, over two ridges to the southwest. As the clay was quarried from the lot, the resulting depression filled with spring water, and a picturesque pond was formed. This pond is still known by locals as the Clay Pond, and was a popular ice skating pond throughout the 1960s and ’70s. The cut stone that forms the upper check dam was apparently quarried from the hilltop to the southeast. Following existing trails, one can still see the switchback mule trail coming down the hill toward the dam, where it is said the teams carried the stone to the site. 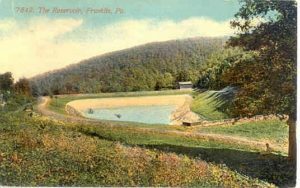 The reservoir was built and maintained by the Venango Water Company, under charter of the city. Franklin City Council had voted to purchase the Venango Water Company facilities in 1884 for $40,000, but did not make the purchase until 1908, following an outbreak of typhoid fever which was blamed on the impurity of the water. By the time the sale was made, the price had climbed to $276,840.97. The reservoir was eventually abandoned when the new plant at Barretts Flats along French Creek was built by the city in 1929. The reservoir currently holds almost no water, and one end of the main dam has been breached. Where is the dam located? Cathy, if you walk up the Third Street hollow, take the trail that follows the sewer line right-of-way, and you’ll come right to it. It’s a steep hike. I am aware of Clay Pond however, I can’t or don’t recall the location of this Reservoir?? Hi Larry! The reservoir is located near the Heights. There is a network of trails that winds over to it from Bully Hill, but it’s a bit convoluted. If you take the trailhead down the hill from Aspen Drive, you’ll go right to it.